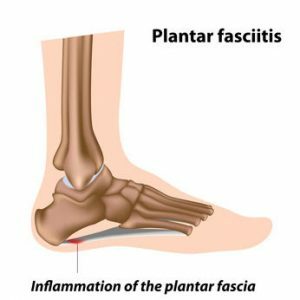 Physical therapists at Delta/Fillmore Physical Therapy and Sports Medicine describe Plantar Fasciitis as a condition that facilitates foot and heel pain. The name is derived from plater fascia, which is a tough band of tissues that runs at the bottom of the foot from the heel to the toes. The tissue pulls from the heel bone to support the arch under the foot as it pushes off the ground creating traction. Therefore, Plantar Fasciitis is the redness or inflammation of the foot on the underside. It is a form of injury that occurs due to the overuse of the plantar fascia. Damage occurs because of repeated stress on the heel of the foot. It often causes pain under heel that may hinder you from walking or running properly. Feeling pain under the heel when you take your first steps in the morning. As you go on the normal activities of the day, the pain tends to go away. Physical therapy at Delta/Fillmore Physical Therapy and Sports Medicine understands that physical therapy is the best approach for treatment. Therefore, they take their patients through stretching exercises. The approach improves motion in the foot. The facility also uses compression bandages to help with the inflammation. It brings down the inflammation, thus reducing heel pain. Unlike any other physical therapist in Delta/Fillmore, UT, Delta/Fillmore Physical Therapy and Sports Medicine offer their clients a personal touch when attending physical therapy. Contact the facility if you would wish for a holistic treatment plan.